Jack Kirby created so many wonderful characters in his long career, but he also came up with all sorts of wild contraptions to get those characters to and from their adventures. 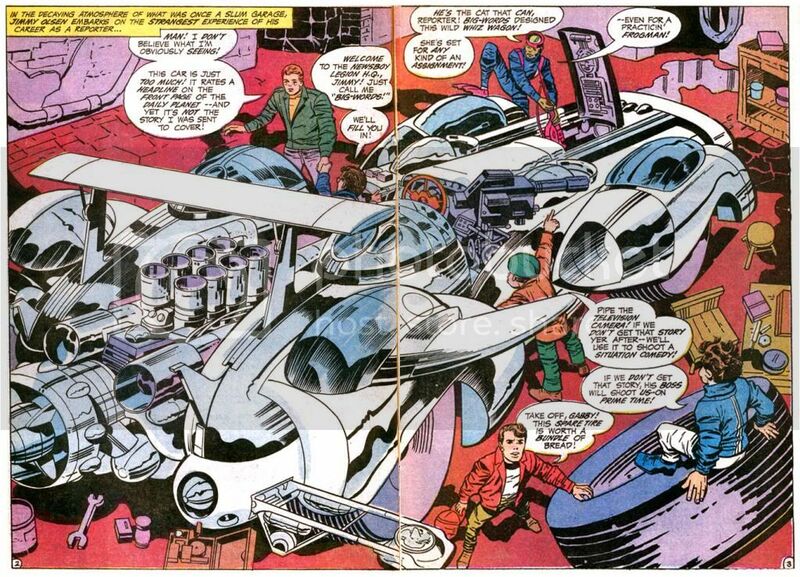 Your typical Kirby vehicle is somewhat outlandish, certainly futuristic, but also surprisingly plausible at a glance, as if he generated detailed plans before inserting them into his stories. You're likely to find jet fans, air intakes and plexiglass cockpits along with all kinds of valves and pipes. A Kirby vehicle is as instantly recognizable as one of his muscular, almost steel-like heroes. The Fantasti-Car! 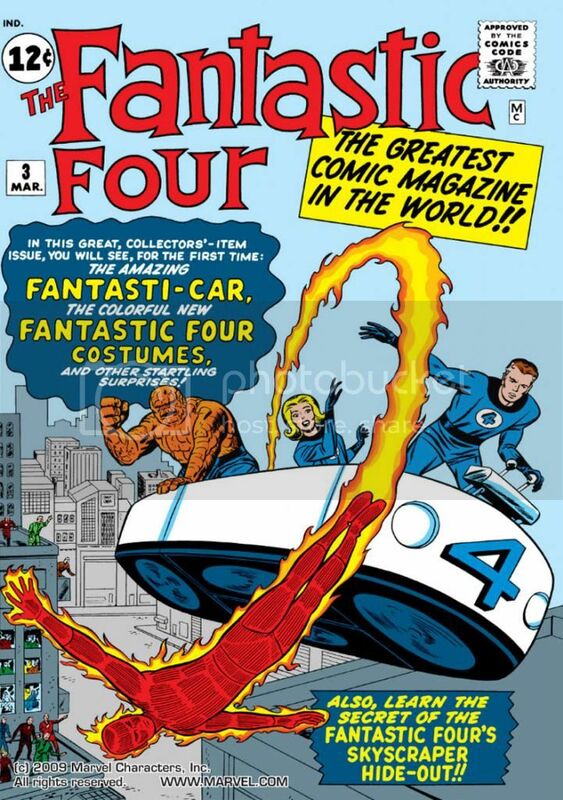 The Fantasti-Car debuts in Fantastic Four #3 (March 1962), which also saw the adventuresome quartet donning their blue costumes for the first time. Like those plain but functional-appearing duds, the Fantasti-Car is a simple design, just a tub with headlights for safety and what appear to be four fans underneath for generating lift. 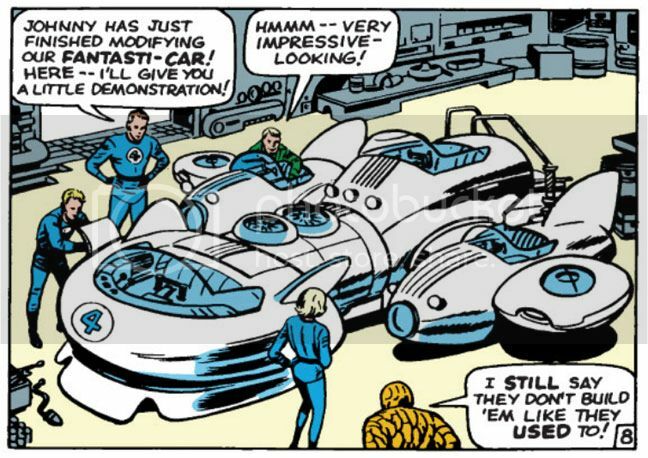 I'm not sure how Reed Richards controls pitch and yaw or generates forward thrust in this version of the Fantasti-Car, but I'm sure Kirby could have explained it if I'd been around in 1962 to ask him. Unfortunately, this isn't the most visually impressive design, and I'm guessing Kirby must have been a little dissatisfied with it, because about a year later, the Fantastic Four upgrade to a hotter version. Yeah! That's more like it! 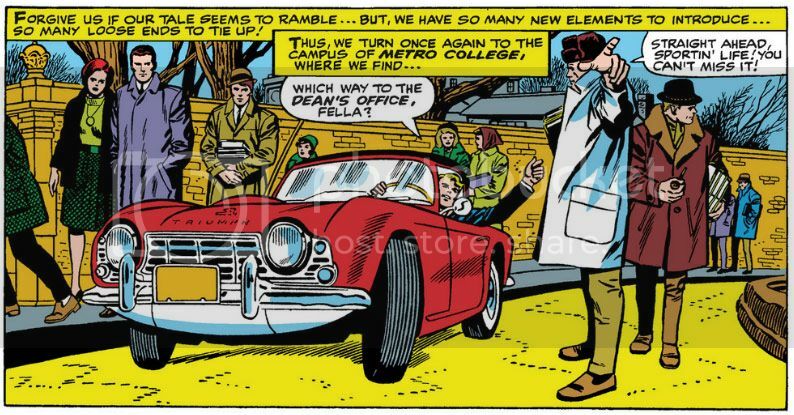 The Fantasti-Car, Mark II made its debut in Fantastic Four #12 (March 1963). This one has aerodynamic styling and possibly a much greater range. Ignore Ben Grimm's little griping remark. Some people just aren't pleased with anything. The Fantastic Four use this Fantasti-Car to travel cross-country and take on the Hulk. But what about ocean-hopping, when the team needs to cross hemispheres, date lines and other such geographic demarcations? The Pogo Plane. 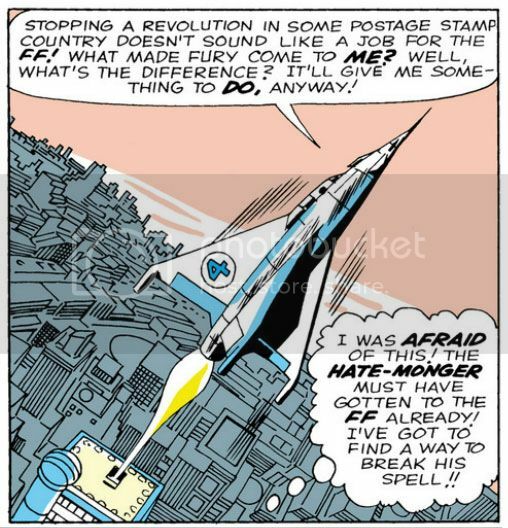 The Pogo Plane previously appeared in issue #3, but it really gets to strut its strato-stuff here as the FF prepare to face the Hate-Monger in Fantastic Four #21 (December 1963). Kirby gives this aircraft a state-of-the-art appearance (at least for the 1960s), like something the USAF or NASA might have been toying around with in the early days of space exploration. The X-51 or the Lifting Body. Man In Space Soonest. The Flying Flapjack. The Apollo Applications Program. Somebody stop me or I'll go on forever. I love aviation history! This could be a wild, right-off-the-drawing-board design lifted from a Popular Mechanics article of the time. It's got huge stabilizing fins and even flaps. Plus it's a tail-landing VTOL aircraft. That's "vertical take-off and landing," to you and me, Russ. I'm no aeronautical engineer, but Reed Richards has that skill set among his many, and you can imagine he saw this one through from the initial design phase to wind-tunnel testing with a scale model to prototype production to flight test with none other than Ben Grimm at the controls. Now that we're on the topic of his piloting skills, here's a little Ben Grimm-related aside-- Ben generally plays the fool with his gruff street-style patois, but he's actually vastly intelligent himself, the kind of guy who would have made the Mercury Seven if he'd actually existed. Ben was a highly-regarded test pilot with a fighter background before he became a superheroic freak, which means he's got quite the expertise in engineering. Tom Wolfe in his book The Right Stuff describes how Ben's closest real-world analog Chuck Yeager (no mean engineer himself) influenced not only aviation history but also how pilots of the era spoke-- I don't know if it's true or not, but Wolfe makes a hilarious and compelling case for airline pilots of the time doing their cockpit announcements in pseudo-West Virginia drawls in imitation of the man at flying's apex. I can imagine in the Marvel world the same thing happening, only with pilots shouting, "It's clobberin' time!" when pushing the outside of that o' envelope, or making reference to their Aunt Petunias in put-on Brooklyn accents. The Airjet-Cycle. This one has neat nozzles and tanks, but it's mostly just pipes and doesn't really look capable of lifting Reed alone, much less Ben and Sue as well. Not the most practical of earthly designs, although it looks like something NASA might have considered for lunar mobility. Leaves the passengers kind of exposed and vulnerable, too-- I love the look of sheer embarrassment on the Thing's ever-lovin', blue-eyed face as he holds on for his very life. The Airjet-Cycle probably comes in handy for jetting to the supermarket, or getting little Franklin to school when he misses the bus. 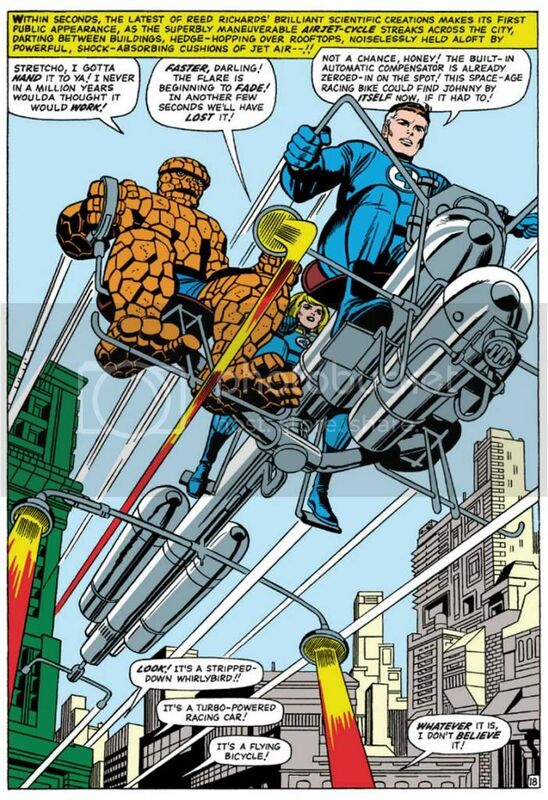 Not as spectacular as either the Fantasti-Car or the Pogo Plane, the Airjet-Cycle nevertheless makes further appearances in Fantastic Four #46 (January 1966), #48 (March 1966) and #57 (December 1966), to name three. The Avengers also use a version. You can look it up. I did! Oops! A ringer! Don't ever think Jack Kirby couldn't bring things down to earth (relatively speaking-- Johnny's got one unearthly ride there) and draw realistic cars. This one reminds me of the classic 1967 film The Graduate, directed by Mike Nichols. Dustin Hoffman actually drives a 1966 Alfa Romeo Spider 1600 "Duetto" in that movie, but Johnny Storm here has a 1966 Triumph GT6. Yeah, a Spitfire might have been more appropriate for the Human Torch, but Triumph introduced the GT6 the year Marvel published Fantastic Four #50 (May 1966), so leave it to Johnny to pick up the latest thing in sports cars. Maybe he's auditioning for a part in The Undergraduate. We're also ditching one comic company for another. Just as Kirby and family left New York for California and Marvel for DC, in the first issue of his eponymous book (November 1972), Kamandi leaves his bunker home in this utilitarian military contraption with a very interesting outboard wheel arrangement. They're heavy duty wheels, too. Probably made of some kind of metal or composite alloy for years of wear. Shovels clamped to the side, weatherproof tarp over the back. This is a very appropriate get-about for Kamandi, and just the kind of thing you'd expect to find at a former military outpost. As you can see, Kirby anticipated the ATV craze. For a while there in south Georgia, you couldn't take a drive without a three- or four-wheeler loaded with people in camouflage barreling out in front of your car from a side road or a trailer park entrance. In fact, you still can't. They're a menace, I tell you, and in this panel from Kamandi #6 (June 1973), you can see why. 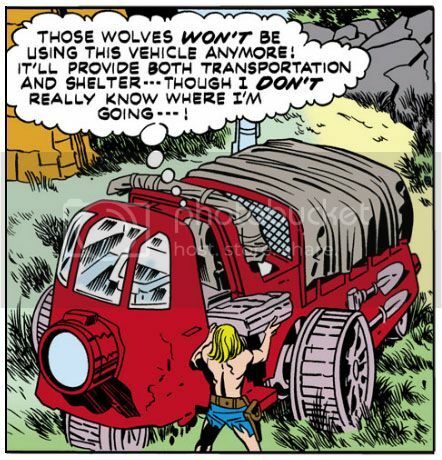 Kamandi and his tragic girlfriend Flower have found yet another hard-working cargo carrier to explore the world, but suddenly they're capsized by a gang of three-wheeling lions! They're huge, too. 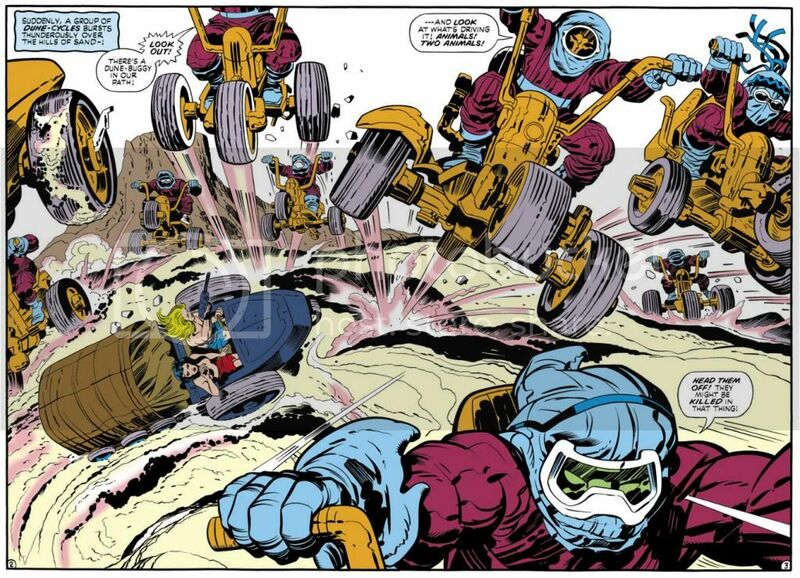 Look how they dwarf Kamandi and Flower in their little cart. These hot-doggin' felines think they own the dunes. They're wrong. The best is last, but not for long! In this spectacular image from Superman's Pal, Jimmy Olsen #133 (October 1970), we first greet the Whiz Wagon, custom-built by the Newsboy Legion just in time to explore the Wild Area with a certain cub reporter. Or photographer. Whatever the hell job it was Olsen did when he wasn't driving Perry White to distraction. Look at the rear spoiler and those crazy intake pipes. Is that a hint of a jet turbine beneath them? Looking like the love child of the second Fantasti-Car and Speed Racer's fabulous Mach 5 by way of a maternity ward in the deepest, darkest, most top secret ward of Area 51, there's almost nothing the Whiz Wagon can't do. The Newsboy Legion uses it to roar down the highway, chase after the Mountain of Judgment with the Hairies from the Habitat, fly, even travel underwater. This is the ultimate in Kirby vehicle design. The Whiz Wagon by itself is an amazing visual, but Kirby doesn't simply fill two pages with a car and call it a day. He loads this spread with details to help you believe in this phantasmagorical creation. There's the spare tire with Newsboy Gabby perched on it (where do they buy those? ), Flipper-Dipper and the forward cargo-hatch, plus tools galore and even some kind of liquid draining away in the background. Hydraulic fluid? Oil? Tears from other artists who saw this and realized they'd never create anything even half so cool? The Whiz Wagon, custom built by the NEWSBOY LEGION! The greatness of Kirby is entirely in that sentence. It's fun. I love the idea of these clever kids coming up with something like a Whiz Wagon. All working together, with danger in mind!